In November, 1942, Anglo-American Forces under General Eisenhower landed on the North West coast of Africa, still nominally under Vichy France control. French resistance was weak and the forces advanced rapidly across North Africa and into Tunisia, where they then met stiff German resistance. The 1st Battalion the Duke of Wellington’s Regiment landed in North Africa in mid March, 1943, to join the battle for Tunisia and Lieutenant Colonel B W Webb-Carter took command in April after his predecessor was wounded and evacuated. The Battalion then took part in two major battles at Banana Ridge (losing 10 killed and 35 wounded) and Djebel Bou Aoukaz (31 killed and 75 wounded) for which the Commanding Officer was awarded the DSO. 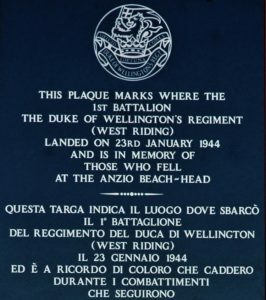 The Battalion, as part of 1st British Division, was then trained in amphibious operations before taking part in the landing and capture of the Italian island of Pantellaria on 9th June, 1943. They then returned to Tunisia for further training. Meanwhile 8th Army had captured Sicily and Southern Italy but had become bogged down on the Gustav Line south of Rome. In an effort to bypass the German defences in January, 1944, the 1st British Division, including the 1st Battalion, was part of a force ordered to mount an amphibious operation at Anzio. However, instead of exploiting the successful landing the Allies concentrated on securing the beachhead, giving the Germans time to recover and close off the landing force. The subsequent fighting over the next four months until the end of May saw some of the most desperate fighting of the war in the swamps and wadis of the Anzio Beachhead and the 1st Battalion played its full part, suffering battle casualties over the full course of the operation of 39 officers 921 other ranks – 10.85% of the total casualties for the Division. The Battalion’s reputation was such that it was selected to represent the British Army at the victory parade to mark the formal entry into Rome. 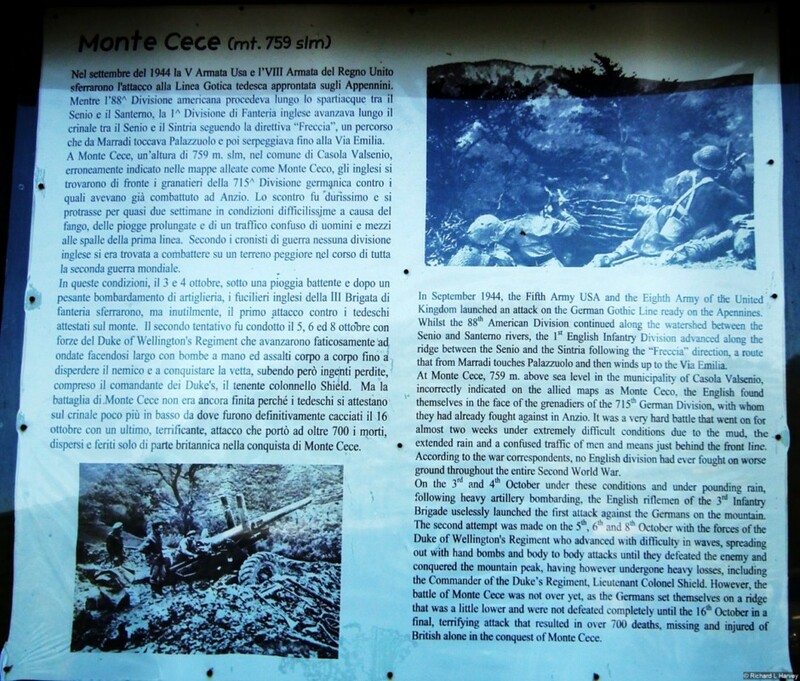 After the fall of Rome the Germans carried out a skilful and methodical withdrawal to the Gothic Line, a well prepared natural defensive line running just north of Florence and across the Apennines, and, in August, the Battalion rejoined the battle, fighting in extremely difficult mountainous country as they pushed the German forces northwards which once again brought a high toll in casualties. In September Lieutenant Colonel Webb-Carter, who had been CO throughout the hard fighting of North Africa, Anzio and then beyond, handed over command to Lieutenant Colonel F P St Maur Shiel who was to command the battalion in their final major battle of the war, the capture of Monte Cece. This feature, which commanded the surrounding countryside, was essential for further progress of the advance. It was bitterly contested and the Battalion finally captured it on 8th October in a battle fought in atrocious weather conditions. Private Richard Burton was awarded the Victoria Cross for his bravery in assaulting, successively, two Spandau machine gun positions which had pinned down the final assault. Unfortunately, just at the moment when success was achieved, the Commanding Officer, Lieutenant Colonel Shiel, was mortally wounded. The Battalion lost two officers and 12 other ranks killed in the battle.